Unbaked One-Crust Pie Crust: Mix flour and salt in medium bowl. Cut in shortening, using pastry blender (or pulling 2 table knives through ingredients in opposite directions), until particles are size of small peas. Sprinkle with cold water, 1 tablespoon at a time, tossing with fork until all flour is moistened and pastry almost leaves side of bowl (1 to 2 teaspoons more water can be added if necessary). Gather pastry into a ball. Shape into flattened round on lightly floured surface. Wrap flattened round of pastry in plastic wrap and refrigerate about 45 minutes or until dough is firm and cold, yet pliable. This allows the shortening to become slightly firm, which helps make the baked pastry more flaky. If refrigerated longer, let pastry soften slightly before rolling. Roll pastry, using floured rolling pin, into circle 2 inches larger than upside-down 9-inch glass pie plate, or 3 inches larger than 10- or 11-inch tart pan. Fold pastry into fourths; place in pie plate. Unfold and ease into plate, pressing firmly against bottom and side and being careful not to stretch pastry, which will cause it to shrink when baked. Trim overhanging edge of pastry 1 inch from rim of pie plate. Fold and roll pastry under, even with plate; flute as desired. Continue with directions in pie recipe. Baked Pie Crust: Heat oven to 475°F. Mix flour and salt in medium bowl. Cut in shortening, using pastry blender (or pulling 2 table knives through ingredients in opposite directions), until particles are size of small peas. Sprinkle with cold water, 1 tablespoon at a time, tossing with fork until all flour is moistened and pastry almost leaves side of bowl (1 to 2 teaspoons more water can be added if necessary). Gather pastry into a ball. Shape into flattened round on lightly floured surface. Wrap flattened round of pastry in plastic wrap and refrigerate about 45 minutes or until dough is firm and cold, yet pliable. This allows the shortening to become slightly firm, which helps make the baked pastry more flaky. If refrigerated longer, let pastry soften slightly before rolling. Roll pastry, using floured rolling pin, into circle 2 inches larger than upside-down 9-inch glass pie plate. Fold pastry into fourths; place in pie plate. Unfold and ease into plate, pressing firmly against bottom and side. For pie, trim overhanging edge of pastry 1 inch from rim of pie plate. Fold and roll pastry under, even with plate; flute as desired. For tart, trim overhanging edge of pastry even with top of tart pan. Prick bottom and side of pastry thoroughly with fork. Bake 8 to 10 minutes or until light brown; cool on wire rack. Two-Crust Pie: Mix 2 cups flour and 1 teaspoon salt in medium bowl. Cut in 2/3 cup plus 2 tablespoons shortening, using pastry blender (or pulling 2 table knives through ingredients in opposite directions), until particles are size of small peas. Sprinkle with 4 to 6 tablespoons cold water, 1 tablespoon at a time, tossing with fork until all flour is moistened and pastry almost leaves side of bowl (1 to 2 teaspoons more water can be added if necessary). Gather pastry into a ball. Divide in half and shape into 2 flattened rounds on lightly floured surface. Wrap flattened rounds of pastry in plastic wrap and refrigerate about 45 minutes or until dough is firm and cold, yet pliable. This allows the shortening to become slightly firm, which helps make the baked pastry more flaky. If refrigerated longer, let pastry soften slightly before rolling. Roll one round on lightly floured surface, using floured rolling pin, into circle 2 inches larger than upside-down 9-inch glass pie plate. Fold pastry into fourths; place in pie plate. Unfold and ease into plate, pressing firmly against bottom and side. Spoon desired filling into pastry-lined pie plate. Roll other round of pastry. Fold into fourths and cut slits so steam can escape. Unfold top pastry over filling; trim overhanging edge 1 inch from rim of plate. Fold and roll top edge under lower edge, pressing on rim to seal; flute as desired. Continue as directed in pie or tart recipe. You can taste the difference! 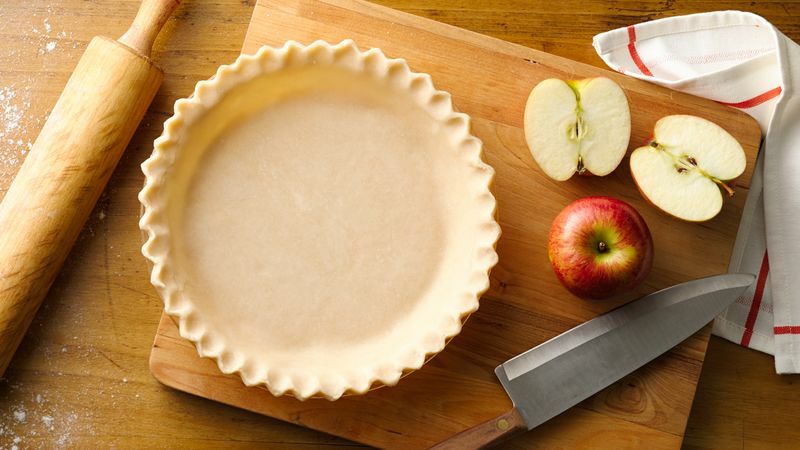 Pie crusts made with self-rising flour differ in flavor and texture from those made with all-purpose flour. If you want, you can use self-rising flour. Just be sure to leave out the salt!